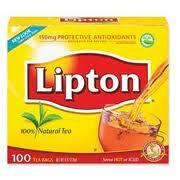 $0.75/1 Lipton Tea Coupon! Great at Stores that Double! Hurry and print this $0.75/1 100ct Lipton Tea coupon! This would be a great coupon to hold onto for a sale, especially if your grocery store doubles coupons!